We have recently been paying a bit of long overdue attention to the Rasps and Files section of the site. We have brought in a new range of Continental rasps - a little dearer than the old ones admittedly, but really, really beautifully made in the traditional manner and I'm confident that they still represent excellent value for money. I am going out on a limb regarding the cleaning of rasps, some say that they should only be cleaned with a nail brush but I have never found this gets them sufficiently clean. Given that wood debris is likely attract and hold moisture against the surface and therefore promote corrosion (far more dangerous to carbon steel than the mechanical abrasion of a file card) we are recommending that you use something a bit more aggressive and get them properly clean. We are also offering a resharpening service on the new ones (as long as it hasn't been abused a rasp can typically be resharpened a couple of times) so if you pop them in the post to us with a couple of pounds per tool to cover return postage we will sharpen them, passivate them and send them back to you. We have simplified matters somewhat by only offering one type of handle, but it is without any doubt the most comfortably shaped file handle I have ever used. Turned from walnut with a brass ferrule it is based on an old design from the turn of the last century. Judging from the feedback we have had so far they are going to be very popular indeed. Our range of Bahco files have also received a little attention, again the new walnut handles and we are gradually introducing a wider range of shapes, sizes and cuts. 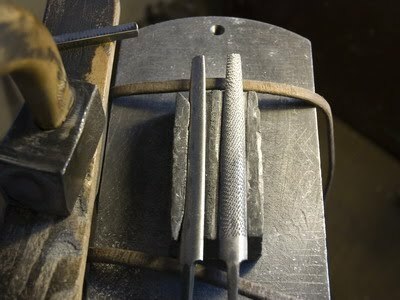 One top tip that was sent in to us was to break in a new file by using it very gently on a piece of brass to ease any high teeth (we are talking fractions of microns here) into line with the others before bringing the tool to bear on ferrous metals. Apparrently this simple step will greatly extend the usable life of the file. I haven't tried it on a saw sharpening file yet, but the next time I start a new one I'll definitely give it a go. Up to now we have concentrated on relatively coarse files as these are the ones that tend to work best with wood. However we are gradually introducing more metalworking files for specific jobs, files for preparing cabinet scrapers, opening the mouths of planes and filing knife backs for example. It will be a gradual process of defining the best tool for each job and then adding them to the range, so if anyone has any particular favourite cuts or shapes please do let me know. My personal favourite remains the Bahco Oberg cut file (if you only have one file in your workshop this one should be it) halfway between a float and file it cuts quickly, can be used on anything from wood to hardened steel and yet produces a supremely smooth finish, a truly remarkable tool. I'm interested in trying your Bahco files. Since I use a special handle for sharpening my saws, could I buy the triangular needle files (2-302-18-2-0) without the walnut handle? second cut needle files work well, but for the last stroke I use third or fourth cut needle files. Do you think you will add these finer cuts to your range line? All of the files and rasps are available without handles for £4.50 less than the handled price. If we end up doing more needle files I will also get colleted handles for them. Cut 2 is the finest Bahco do in a 7" needle file but they do a 6-1/2" cut 4 (in fact if we can get away with it as a saw file for the very finest saws it would leave an even better finish than the 7" cut 2). I it just the triangular ones you use or would other profiles be of interest as well? You're right, Matthew, I checked the Bahco catalog and 180 mm tree square needle files are only in cut 0 and 2. I can find cut 4 only in 140 and 160 mm files, but I prefer longer ones. Anyway I will buy a coupule of 180 mm Bahco files from you and give them a try, but since files without handle are not reported on your webstore, I'll contact you by email.